31 Days of Decorating Inspiration! It's crazy to think that I haven't blogged in almost a year! WoW, where did the time go?! A lot fun stuff has happened over the past year, I'm not sure where to even begin. This past winter was ridiculously crazy, with large accumulations of snow with many very cold and blustery days. The great thing about all the snow was the Mount Everest Chad built with the Bobcat in the yard. When we could, we spent much of time sliding down the "mountain". Lillian loved riding on the sled! Lillian like to scoop up the snow while riding to eat! What a tasty treat! Even Chad and I rode on the sleds! Apparently the tractor doesn't stop if you fall off! This was what the kids and I built and played with one weekend, it was a very productive weekend! Lindsey was a French Hen, she does speak a wee bit of French! Jacob wanted his front teeth for Christmas! Of course Kyle isn't to old for Santa, if there is candy involved! Seriously wish taking pictures of four kids were easier! Lillian wanted to see herself on the camera! Oh the faces the little girl makes are hilarious! Finally I got a good one! Jacob started Kindergarten! He and Lillian both look thrilled! He obviously wasn't too excited! He sure was missed by Lillian! We went to the Indianapolis Zoo, Kyle, Jacob, Lillian, and I pet the little sharks they have. Chad and Lindsey didn't! I don't remember why! Obviously no picture of that, didn't want to feed the shark a hand or a camera! Kyle and Lillian wanted to run with the cheetah, but the cheetah was too tired! So, we hung out with the birds! They were so pretty to look at! I wish I had these birds hanging around my house! Jacob and I celebrated our birthdays together, as we have ever since he was born! Lillian has a bad habit of overshadowing some peoples birthday candle blowing! Exactly one week ago on May 23rd, Kyle graduated from 6th grade! What, how did that happen, how can he be old enough to go to middle school already?! His school makes a big production about ending sixth grade by having a small graduation breakfast for the students and their family members. A certificate of completion is handed out with a tee shirt and awards are announced. Kyle was the first one to be called so I didn't have enough time to run up front to take better pictures! He told me he was glad his class went first and that he was the first one so he could get it done and over with! He mentioned that he was glad he could sit and watch all his classmates! Finally school is out for the kids! (And I have been for a few weeks!) This past semester seemed to drag by rather slowly for me. Although the highlight of my semester was going to China Town for a field trip! Since I had a class about China our awesome teacher decided to take her classes up to China Town. I did a presentation the week of our trip teaching the class Chinese! Yes, I can speak a little! Let me just say, I rocked that presentation and my teacher and class really enjoyed it! (everyone else did boring power point presentation, so I wanted to be really different from everyone else and use the board. I sure accomplished that!) I had the whole class speaking and writing Chinese during the presentation, it was rather entertaining. Was was really entertaining was when we went to China Town. I was excited three ladies that I had really became close with over the semesters went on the trip too, which made it even more enjoyable. China Town may only be a couple of blocks long, but wow is it different! The grossest thing for me was walking into the supermarket. As soon as I walked in I had to walk back out! The smell and things I saw hit my stomach and I knew I couldn't handle it. So a friend and I stood outside talking while the others shopped. Later on we had lunch which was good, we ended up ordering a variety of different things to try. 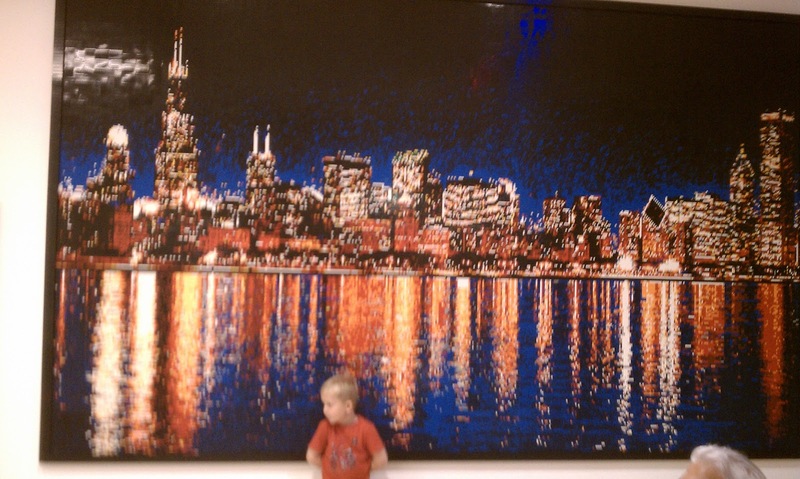 I love looking at the Chicago skyline! 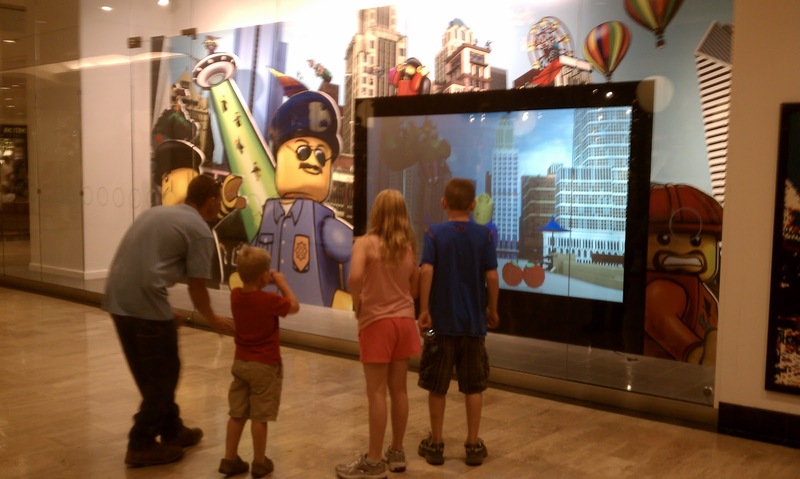 See the Willis Tower! This is the building we stood looking while the others were in the super market! After leaving China Town we decided to head over to Little Italy for some canolli's and Starbucks! That was the highlight of the trip for me! The two areas are very different from each other and I prefer Little Italy! Also, the sun came out when we arrived there, and the people friendlier in that area. It was a great experience and I'm glad I went. 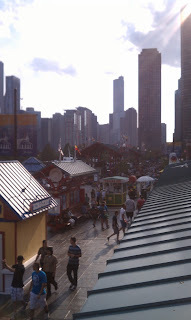 Although it doesn't take much to convince me to go to Chicago, I like how different and fast paced the city is from what I'm used to on a daily basis. I like to visit the city, I don't think I could ever live in a big city like that, I like a slower pace of life. 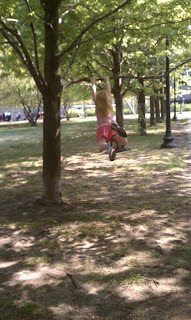 Lindsey went on a field trip a few weeks ago that I had the opportunity to chaperon with. We learned about the canel near by and how life was during that time period on the canel. 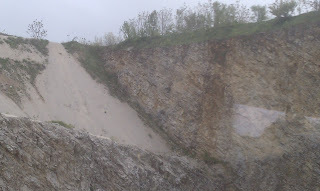 We also went to the bottom of a gravel pit. 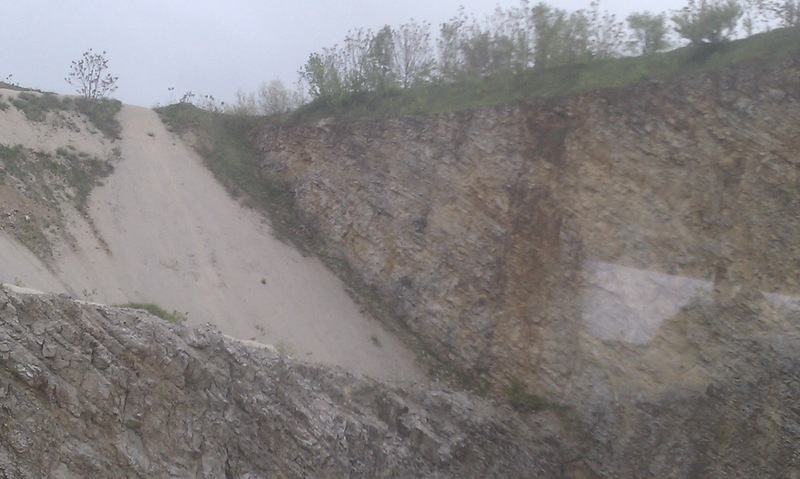 (I was rather nervous about it, I have fear gravel pits and how deep they are.) Thankfully we made it down and back up safely, in fact I really couldn't tell that we were 200 feet down in the earth! The ledge in this picture doesn't look very high up, but it is! 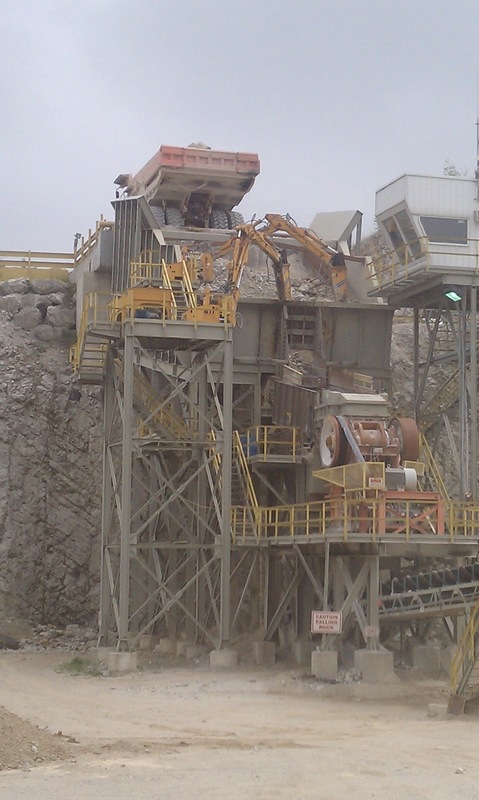 The dump truck at the top dumping the limestone off to a crushing machine. As usual, I enjoyed Lindsey's field trip too! 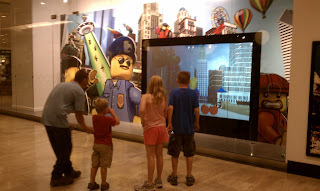 I have thing for field trips, I love to chaperon and I enjoy watching the kids interact with each other along with how they react to seeing something that they only talked about in class. It was a beautiful Saturday morning in June as we loaded up to make the drive to Chicago with four kids in tow, running shoes and a rather large jogging stroller. The trip up there wasn't too bad considering it could have been worse, it was Lillian that I was worried about. She was not a car rider, although currently she has somewhat grown out of that stage in life. I was overly excited, I love a big city and especially one along Lake Michigan. The kids were giddy too, I could tell once we got in the city they were mesmerised by all the tall buildings, and possibly the fact they knew where we were going! 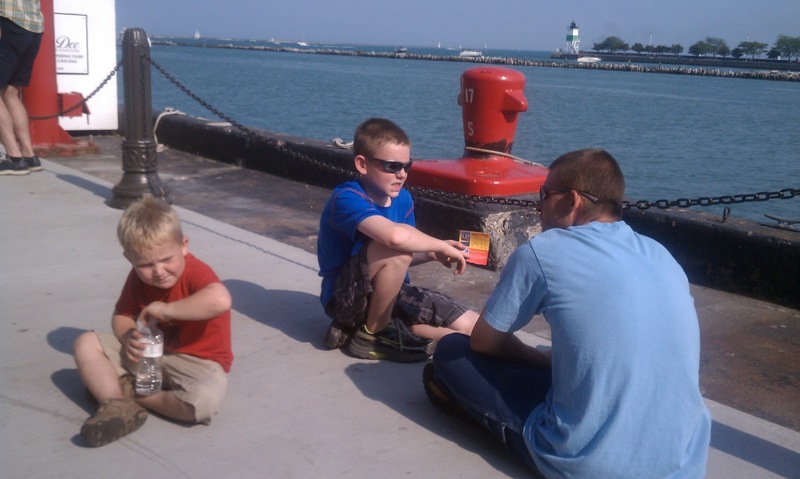 We arrived at Navy Pier and ate lunch, I felt a little overwhelmed with all the people. I could not believe the amount of people crowed in that building. We went outside and started walking to the places we had planned on going too. I had google mapped the route and thought I did a good job by staying away from the main highway. I somehow missed the fact they had an overpass that you were to walk up the stairs. Something that was not convenient with a stroller. So we turned down a side road and walked past some really cute shops and restaurants. We finally made it to Michigan Ave. and I could not believe the amount of people on the sidewalks there. Thankfully the kids knew to stay with us and not try to walk ahead. We past at least two street beggars, one of which looked like a younger man in his lower twenties maybe. The streets were also filled with people trying to sell things and you learned quickly to not look at them or just say no thank you. 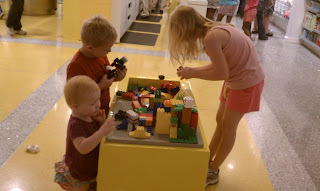 We made our way up the Lego store and I could not believe the things they had made with Lego's. The boys had a certain amount of money they could spend and I think they may have been overwhelmed with so many choices. (or at least Kyle was, Jacob knew what he wanted!) 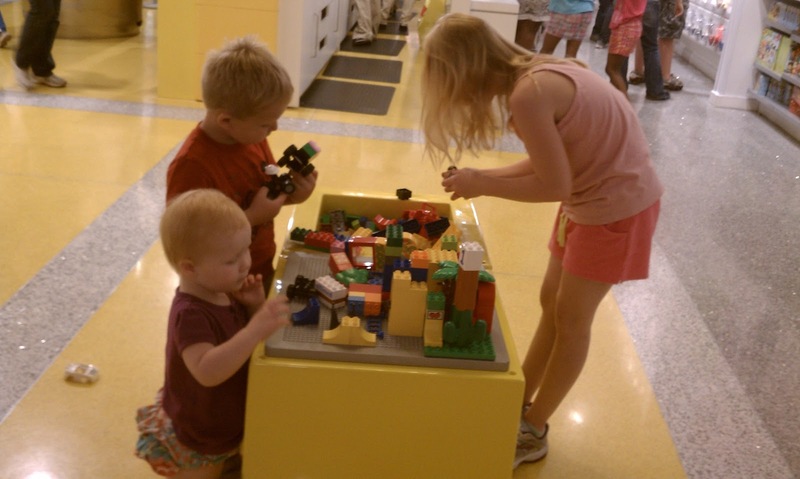 The kids enjoyed playing with the Lego's they had set up at different areas throughout the store. 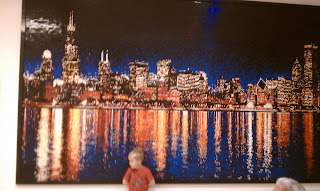 This picture below is made completely of Lego's! How amazing is that!!!! 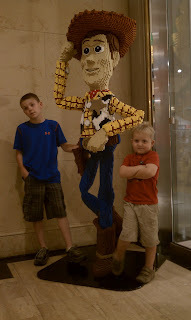 Once we finally managed to get out of the Lego store and we headed to the much anticipated John Hancock building right across the street! The kids were so excited to go all the way up to the top! Before our trip we had watched You Tube videos and found many interesting facts about the building. Unfortunately for me I didn't want to take the elevator and go up to the 95th floor once I got there! WHATS WRONG WITH ME! I was so excited about going up to the top but once I saw the building right there in front of it I felt sick to my stomach. I have a HUGE fear of elevators and heights, I know how fun! So Chad ended up taking Kyle, Lindsey and Jacob up to the top for 5 dollar pops! Lillian and I stayed down at the bottom and watched the people go by. We seen two brides and their party getting ready to go up the observatory while we waited and waited and waited for Chad and the kids to come back down! I am a wife to Chad my highschool sweetheart, stay at home mom to four amazing children Kyle, Lindsey, Jacob and Lillian. I love spending time with my family also I love to sew and own a childrens clothing boutique online. I love to decorate, read decorating magazines and books, I love to read and study scriptures, try new crafts, baking and trying new recipes, spend time at the beach in the summer, play with the kids in the backyard, become inspired by others, try new things!